Despite being around for a couple of years now, Pinterest reached mainstream popularity only this year. WP Pin Pro aims to help marketers take advantage of this new social site. It is a plugin and a crash course rolled into one. Being the only (so far) product from the Rapid Crush Club that is made for Pinterest users- and those interested in it-it is easy to wonder, is it worth your time? Well, find out more about it in this review. Nowadays, it pays to be social online. Aside from the tried-and-tested sites like Twitter and Facebook, Pinterest is starting to gain a good following. Although the Palo Alto, CA-based company launched this online pinboard site in 2010, it is really only this year that it made itself a household name. Then again, the question is: is Pinterest worth the effort? Well, aside from testimonials from share-a-holics that the site sends significant traffic to their money sites, recent data showed that starting January, Pinterest has 11.7 million unique visitors in the US alone. The great thing about WP Pin Pro is that it comes with a set of instructions for you to fully get its benefits. When you sign up for this product, aside from the easy-to-install plugin, you would also be given a series of training videos to get the best results from Pinterest. In these videos, you will learn Jason three-step formula to making the most of out this virtual pinboard. The first step to using this plugin is to make sure that you have settled and familiarized yourself with the site first. Make sure you have manually pinned some photos and followed some pin boards. The last thing you want people to think is that you are spamming in Pinterest. When you use Pinterest (or any social media for that matter), Jason said it is important to not put all your time and effort in it right away. Start gradually and slowly. In using WP Pin Pro, be sure to really pick images or boards that is both interesting and related to your niche or products. Depending on the results of the previous phase, in the last step, Jason will guide you on how you can make Pinterest more effective for you and your business. 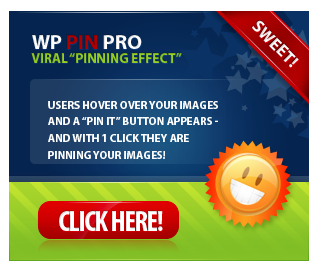 The goal of installing WP Pin Pro into your website is to make it very Pinterest-user-friendly. With this plugin, the moment someone hovers over your videos or images, they would be given the option to pin it. Once a person clicks on “pin it” button, they would be able to pin your content into their own boards. They will also be given the option to Tweet about your site or your pin. What you do next is to wait for your images/videos to make its way from board to board. Like all of the Rapid Crush Inc.’s products, WP Pin Pro comes with a 30-day money back guarantee. There are also three pricing packages to choose from. Each package comes with a year-long free customer support and updates. If you are an avid fan of Pinterest, WP Pin Pro is definitely worth checking out.